Stained glass is an art form using colored glass that permits light to pass through it instead of drawing on or coloring a surface that reflects light. It is set apart from nearly all other arts in two dimensions. Ordinarily, designs are made from glass panes of different colors, held in place by narrow lead strips and enclosed in a metal framework. The only known stained glass artist in the country, Melanie Holmes of San Pedro Town, studied and practiced this art in her native Canada for more than 20 years before making Belize her home. A pharmacist by profession, Melanie was introduced to this art in 1979 by a friend who convinced her to take a stained glass course. When she moved to Belize in 1998, this hobby progressed into a potential second source of income. Since then, her skills have been requested by several private individuals and businesses as well as by a patron for St. Joseph's Parish in Belize City. The use of colored glass for filling windows dates from Roman times, when blown glass, which can be made very thin, began to replace molded glass for many purposes. The technique now known as stained glass is an invention of the 9th and 10th centuries. The many surviving examples from the late 11th century on, make it possible to understand exactly how this richly beautiful art form was done. Stained glass became a major part of church architecture in the Gothic period, when the style of churches changed. It replaced the décor of earlier churches, which displayed mural paintings or mosaics. In Gothic churches, ribs and shafts freed walls from bearing so much of a building's weight, and stained glass came to be used as a kind of translucent wall, transmitting and coloring the light that shone on it. Early Christian, Islamic, and medieval architecture also made limited use of colored transparent glass. In the 12th century, France and Germany were the major creative centers. Throughout the next centuries many changes took place in the art of stained glass, evolving from windows in abbeys, cathedrals, and early monuments into mosaics popular in Italy and Switzerland. For a time, the requests for stained glass went through a period of decline. The architecture of the High Renaissance and after had little use for stained glass. This trend continued until the 19th century, when renewed interest in the Gothic period led to the restoration of existing monuments and the building of new churches in the Gothic style. In England, Edward Burne-Jones and William Morris worked to revive the art. In the United States, at the end of the century, Louis Comfort Tiffany made stained glass a popular form of interior decoration. Although there are many forms, techniques and glasses used in stained glass, Melanie Holmes explained her methods for working with glass and how she comes by her materials. Since some colors allow much more light to pass through than others do, choosing glass to work with is a task in itself. Glass comes in a kaleidoscope of colors produced by adding oxides of various metals to the sand and other elements from which glass is made. For example, cobalt and chromium produce blue. In the art of stained glass, there are basically two types of glass used: cathedrals, which are transparent and transmit light very well; and opalescent (opals), characterized by a milky, translucent look. >From these two general categories, dozens of types and textures of glass are manufactured such as: glue chip, wispy, ripple, corded, crackle and ring-mottled. Melanie often selects her glass from a catalog, but many times she must travel to Houston, Texas in order to see the true colors, and to choose that special sheet of glass since no two sheets of art glass are alike. Her order is shipped in two by four-foot sheets by truck from the US to Belize in volumes of 40-50 panels of glass per crate and then transported by barge to the island. "Fortunately, most deliveries are not damaged in transit and very few pieces have ever been destroyed," Melanie exclaimed. Although a variety of techniques, tools and methods are used in creating a stained glass work of art, Melanie summarized the way she works. First, she or the customer makes a selection from a pre-fabricated or original design. Commercial patterns or templates from books may be chosen or custom designs drawn on paper. Glass is selected and cut to match the shapes shown on the model using a variety of tools to cut out the shapes. Melanie then trims it to size using special "grozing" pliers and grinders to mold the glass edges to perfection. After the pieces fit like a completed jigsaw puzzle, the framework for the piece is laid out using metal channels or copper foil to encase the glass pieces in the design. Then the joints are soldered together and the finished piece is cleaned. Just like that - another work of art is ready to be displayed! Melanie credits her grandmother for passing down a talent for arts and crafts. 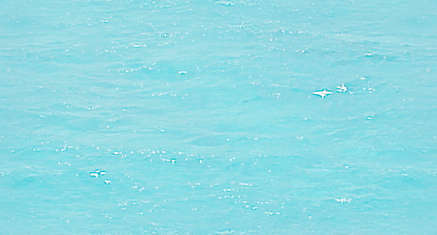 She claims her creative inspiration blossomed though from living in Belize's tropical paradise for the past four years. Designs that once came only from books or magazines, are now inspired from the flora, fauna, sparkling waters and amazing light found in her natural environment. Melanie's styles include traditional, art deco, abstract or individual designs. 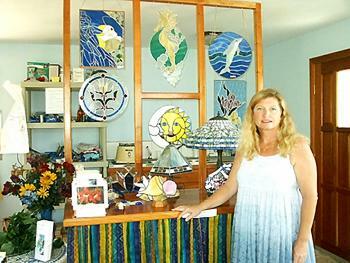 Although it is a popular misconception, Melanie stated emphatically, "I do not paint glass." She does not bevel glass either, but will etch designs on stained glass using an acid-etching technique. At her client's request, Melanie creates stained glass lamps, door panels, windows, kitchen cabinets, bathroom window panels and patio stones, beautifying a number of local residences as well as businesses, including Celi's Restaurant and Banana Beach Resort. Local photographer Kay Scott was her first residential client, commissioning an orchid window for her home. Melanie's artwork can also be seen adorning the windows of the San Pedro Post Office and decorating the panes of Isla Bonita Gallery and Frame Shop. One of her most challenging requests is displayed inside the home of local resident Ramon Nuñez. Requested by his daughter-in law Josie, this custom-designed hanging features a stained glass portrait of three of Ramon's favorite dogs: a poodle, a Rottweiler and a German shepherd. Located three miles south of San Pedro in a picturesque little yellow cottage, Melanie's studio and gift shop, Déjà Vu Glassworks, is absolutely filled from floor to ceiling with colorful items to adorn a home, or body. Also filling her studio is the work of several local artists which Melanie describes as a variety of "unique handcrafted art, sold exclusively at my shop." True to that statement, at Déjà Vu you will find everything from sun-catchers and intricately designed tiffany-style lamps to Batik wall hangings and clothing. Oil paintings, giftware, pillows, hand-painted household items, ornaments and greeting cards are also available for sale. On any day, (except Thursday and Sunday), from 9:00 a.m. to noon and 1:00 to 4:00 p.m. you can find Melanie delighting in the creation of another unique piece of art, designed to catch your eye. More than just decorative pieces, her stained glass treasures of light truly reflect the beauty of the place she now calls home, "La Isla Bonita".